Since its adoption, the Basel Convention has seen a number of significant developments. The Amendment to the Convention on the Con­trol of Transboundary Movements of Hazardous Wastes and their Disposal (“the Ban Amendment”) was adopted by the third meeting of the Conference of the Parties (COP) in 1995. The Ban Amendment provides for the prohibition of ex­ports of all hazardous wastes covered by the Convention that are intended for final disposal, reuse, recycling and recovery from countries listed in annex VII to the Convention (Parties and other States which are members of the OECD, EC, Liechtenstein) to all oth­er countries. As at 1 January 2011, the Ban Amendment has not yet entered into force. The challenge of protecting vulnerable countries from unwanted hazardous waste imports, while not precluding the import of wastes considered valuable secondary raw materials to countries in a position to manage them in an environmentally sound manner has therefore gained importance. Informal discussions were initiated at COP 9 in 2008 to identify a way to enable the entry into force of the Ban Amendment while addressing the concerns and needs of all countries in this context. Annexes VIII and IX to the Convention, which provide further elaboration as to the wastes regulated by the Convention as listed in Annexes I and III were adopted by COP 4 in 1998. The Basel Protocol on Liability and Compensation for Damage resulting from Transboundary Movements of Hazardous Wastes and their Disposal was adopted by COP 5 in 1999. The Basel Protocol regulates civil liability for damage resulting from the transboundary movement of hazardous wastes and other wastes, including incidents occurring as a result of illegal traffic. As at 1 January 2011, the Basel Protocol has not yet entered into force. Delegates at COP 5 also agreed on an interim arrangement to cover emergency situations until the Protocol en­ters into force. COP 6 in 2002 approved the Interim Guidelines for the Implementa­tion of decision V/32 on the Enlargement of the scope of the Technical Cooperation Trust Fund. A Committee for Administering the Mechanism for Promoting Implementation and Compliance was established at COP 6 in Geneva in 2002. The objective of this mechanism is to assist parties to comply with their obligations under the Convention and to facilitate, promote, monitor and aim to secure the implementation of, and compliance with, the obligations under the Convention. The mechanism is non-confrontational, transparent, cost-effective and preventive in nature, simple, flexible, non-binding and oriented in the direction of helping parties to implement the provisions of the Basel Convention. One of the most important contributions of the Basel Convention over the past 20 years is the elaboration of a significant number of policy instruments with non-binding character. Within the framework of the Convention, a large body of technical guidelines on the management of specific waste streams has been developed by technical government expert groups and approved by the COP. These non-binding instruments have been designed for the use of Governments at all levels, as well as other stakeholders, to provide practical guidance and thus facilitate the management of the relevant waste streams. In 2002, COP 6 adopted the Strategic Plan for the implementation of the Basel Convention for the period 2002 to 2010, to assist developing countries and countries with economies in transition in implementing the provisions of the Convention. Numerous national and regional capacity building and training projects have since been implemented under the umbrella of the Strategic Plan, with the assistance of the Secretariat and the Basel Convention Regional Centres. COP 10 in October 2011 is expected to adopt a new strategic framework for the period 2011 to 2021, defining the fundamental aims and priorities of the Convention for the relevant decade while taking into account changes that have occurred since its adoption. COP 6 also established a partnership programme with business and industry. Under this programme, two public-private partnerships have thus far been successfully launched, both with the objective of developing specific technical guidelines – to be used by the relevant industry and authorities for the management of end-of-life electronic devices and electronic waste – and initiating relevant pilot projects at country level, including in companies. Between 2003 and 2008, the Mobile Phone Partnership Initiative (MPPI) developed guidelines for every stage of the management of end-of-life mobile phones, which are being used in relevant facilities. 2008 saw the inception of the Partnership for Action on Computing Equipment (PACE) by COP 9. Building on experience gained with the MPPI, PACE is working to increase the environmentally sound management of used and end-of-life computing equipment. The Bali Declaration on Waste Management for Human Health and Livelihood, adopted by COP 9 in 2008, has affirmed at the political level that waste, if not managed in a safe and environmentally sound manner, may have serious consequences for the environment, human health and sustainable livelihood. The commitment agreed by Ministers in the Bali Declaration to prevent the illegal transboundary movement of hazardous wastes, minimize the generation of hazardous wastes and promote the safe and environmentally sound management of waste within each country has since been supported by other international organizations. Following the UNEP Governing Council / Global Ministerial Environment Forum in 2009, the World Health Assembly in May 2010 and the Human Rights Council in June 2010 also highlighted the link between toxic waste, human health, and the enjoyment of human rights. Recently, the management of hazardous chemicals and wastes has moved up on the international political agenda in the context of environmental governance. This is in no small part due to what has become known as the “synergies” process between the Basel, Rotterdam Convention on the Prior Informed Consent Procedure for Certain Hazardous Chemicals and Pesticides in International Trade and the Stockholm Convention on Persistent Organic Pollutants. Several years of deliberations through a Party-led process culminated in the successful simultaneous extraordinary meetings of the Conferences of the Parties to the Basel, Rotterdam and Stockholm conventions (ExCOPs) took place in Bali from 22 to 24 February 2010. A “first” in the history of international treaties and the highlight of the synergies process thus far, the ExCOPs gave directions for countries to implement the three conventions in a more holistic and coordinated way. The conventions have joined forces to better address the challenge of environmentally sound management of hazardous substances at different stages of their life cycle. 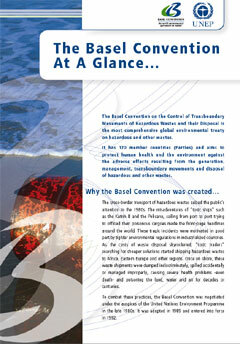 The Basel Convention celebrated its 20th anniversary in 2009 – an event commemorated in November 2009 in Basel (Switzerland). On this occasion, Kenya, Indonesia, and Colombia, the past, present and future Presidents of the COP, together with Switzerland as the host of the Diplomatic Conference in 1989, launched the Basel Waste Solutions Circle, an initiative showcasing projects at all levels that contribute in a concrete manner to the implementation of the Bali Declaration. Over the past 20 years, the Basel Convention has had ample occasion to adjust to new global developments and needs with regards to waste management over the years, and has risen to these challenges. With the added benefit of closer cooperation with the Rotterdam and Stockholm conventions, the Convention now has the potential to start considering wastes more in a life cycle context. This will make it possible to embrace new ways of thinking. The Basel Convention plays a decisive role in achieving the Millennium Development Goals (MDGs) - poverty reduction, reducing child mortality, improving maternal health, ensure environmental sustainability. Waste minimization undoubtedly leads us to achieving the MDGs. In addition, state-of-the art recycling in accordance with agreed standards could create business opportunities and safe jobs; a higher yield of secondary raw materials; conservation of precious resources through extraction and re-use rather than primary mining; and better protection of the air, soil, water and thus human health. Realizing this potential might also lessen the incentives for illegal recycling operations, through providing legal, safe and economically rewarding alternatives.